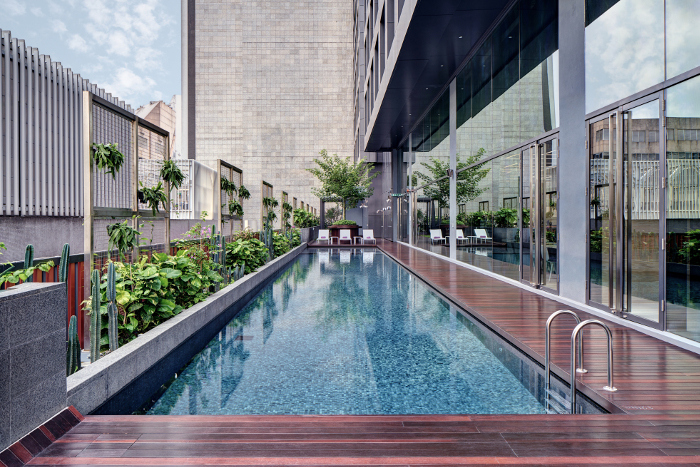 Fancy taking a staycation in the heart of Singapore? Just a 3 minutes walk from Orchard MRT station with easy accessibility to the rest of the city, YOTEL takes the essential elements of luxury hotels into smaller, smart spaces and deliver extraordinary value and a sense of community with areas for co-working, social gatherings and exercise. Inspired by the luxury of first-class travel, YOTEL is known for its intelligently designed cabins (YOTEL-speak for rooms) and each cabin includes YOTEL’s signature adjustable SmartBed™ with rejuvenating rain showers and smart TVs, multi power and USB points and easy connectivity. There are seven cabin types to choose from – Premium Queen, Premium Queen View, Premium Queen with Bunk, Premium Queen View with Bunk, First Class Queen, First Class Suite and VIP Suite. P.S. The bunk beds are a hit with the kids! Visitors will be able to say hi to YOSHI or YOLANDA, YOTEL’s very own 24-hour service amenities robots. The robots are clever enough to navigate around the hotel autonomously, and each robot even has its own unique voice and personality. The Club Lounge area on level 10, also known as ‘TEN’, consists of KOMYUNITI, YOTEL’s bar and restaurant, a swimming pool, an alfresco terrace, co-working space and a 24-hour gym. Parents can have a relaxing evening with the kids at the pool area beside the restaurant, or laze around the terrace area. Room rates start from S$180++ and the Premium Queen with Bunks are especially good for families with children. 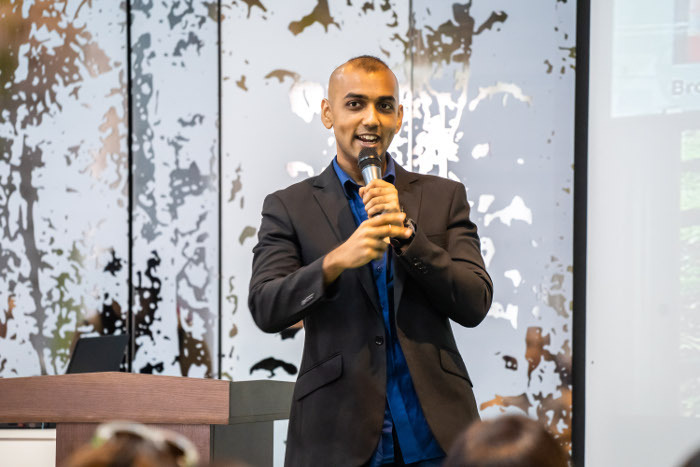 Launched on 1 November 2018, the 238-seater bar and restaurant is helmed by Head Chef Mark Tai and F&B Manager, As’ad Isnin – both of whom will bring guests on a journey with their various experiences, inspirations and memories. Both menus feature dishes and drinks that are all about fun, creativity, ensuring that a visit to KOMYUNITI will always be memorable. Breakfast starts serving from 6.30AM – 10.30AM (11AM on Sat, Sun, Public Holidays) while Lunch and Dinner are available from 12PM – 12AM (1AM on Fri, Sat, Eve of Public Holidays). 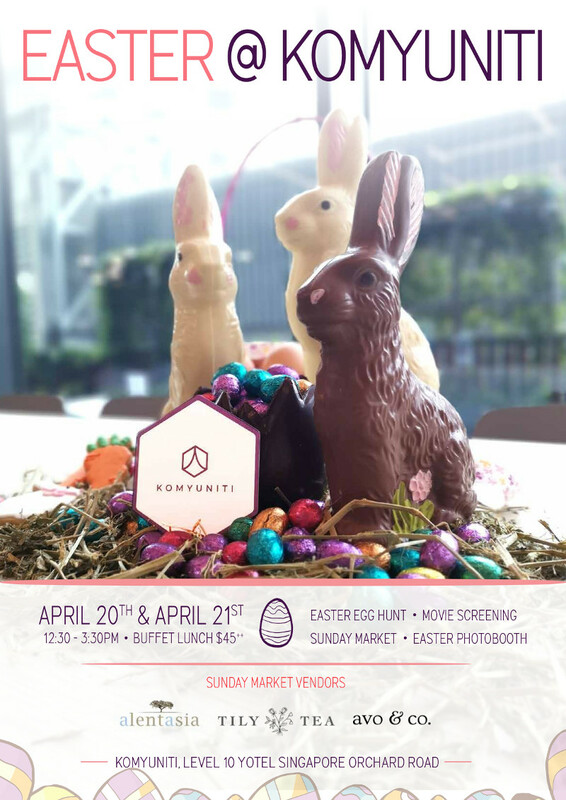 There’s also activities happening at KOMYUNITI this Easter! Stand to win a 2D1N Stay in YOTEL Singapore this Easter Weekend! 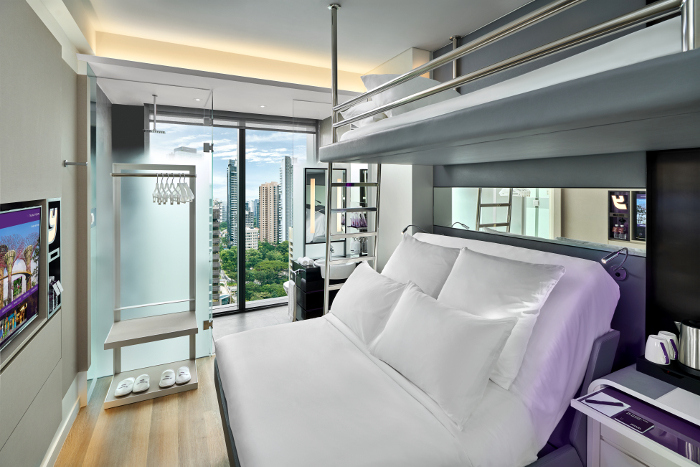 Stand a chance to win a staycation at YOTEL worth over $500 in YOTEL’s Premium Queen with Bunk*! This giveaway redemption is only valid for the Easter Weekend, 20 – 21 April 2019. 2 .Join any of our Facebook Groups here. 3. Comment, Like and Share our YOTEL Singapore Giveaway Facebook Post. Prize redemption is only available on Easter Weekend (20 – 21 April 2019).